I recently updated both VS 2017 and VS for Mac and now VS for Windows says that there is a mismatched Xamarin.iOS version and I can no longer build my projects. VS Win installed is 15.9.11 released today but it does not contain the same Xamarin.iOS version as the most recent VS Mac, also installed today. How can this be fixed? I cannot update to VS Win 2019 at this point. VS 2017 gives me the option to override the Xamarin.iOS SDK on the Mac but this seems like a drastic solution. Anyone have any ideas on how to get this working again? Is there a manual download for Xamarin.iOS 12.6 for VS 2017 (I cannot seem to find one). In the same boat. Originally it started because I suddenly got a Mac Connection mismatch between Mono versions. My VS 2017 was suddenly looking for 5.18 and my Mac had 5.16 even though I have been coding on it all day. So I updated Visual Studio on my Mac but did not realize it was updating VS for Mac to 2019. Now I have the same Mono versions but now VS 2017 is expecting Xamarin.iOS SDK 12.4 but my Mac has 12.6. Last time something like this happened VS got a new update the very next day. Yes - that is exactly how this started for me as well, with a Mono version mismatch. I too also did not realize until too late that it was the 2019 update on the Mac side when I updated it all. I also encountered this issue today. I eventually let VS for Windows downgrade the Xamarin.iOS SDK on my Mac to version 12.4 and was able to pair again. Not ideal but at least I can get back to work now. If you downgrade the iOS SDK on Mac, then can you still use VS on Mac and VS2019 on Windows? Vs2019 on Windows has got iOS 12.6. I have applied all the upgrades to VS2017 and now it is version 15.9.11. Can't I upgrade iOS SDK on VS2017 to 12.6? 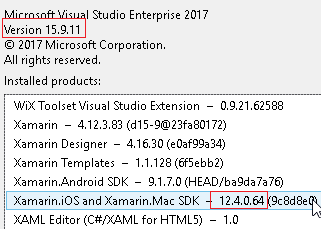 Even going to the xamarin release site I only see the VS 2017 15.9 update with 12.4 ... no mention of 12.6. I'm starting to believe downgrade is the only option. Currently I am pursuing only one app. Copied it to another drive and tested with VS2019. There were no issues, may be because I am not using any extraordinary Nuget Packages besides SQLite and JSON. So I am switching to VS2019 and hope I face no issues when my other apps are also actively developed. If you downgrade Xamarin.iOS on the Mac I don't think you can use VS2019, because it ships with 12.6. @CTurner : "Downgrading the Mac to 12.4 let me get past this blocker." You kept VS2019 on MAC, and downgraded Xamarin.iOS to 12.4, or you also had to downgrade VS2019 -> 2017 on your MAC? Keep VS2019 on Mac and downgrade Xamarin.iOS to 12.4. No need to downgrade VS to 2017. I am also having this issue. I was considering filing a bug/issue report on the Xamarin.iOS Github page, but I wasn't sure if this was technically more of a VS issue. I have switched to VS 2019 and everything works fine now. I would like to better understand why the Mono version changed suddenly which started this cascade of events. I am also very discouraged that the VS on Mac update did not better convey that it would upgrade my VS version to 2019 IN PLACE especially given that there would be no way to connect to my Mac using VS 2017. This is poor planning IMO. This. I also would like to know why would they only push 12.6 for VS 2019. Why not push the update for VS 2017 and 2019 and make for a seamless transition/help those of us that cannot upgrade to 2019 for whatever reason? Great. How can I do that on the Mac? I could not find such option in Mac/VS2019. I tried from Win/VS2017 (that offered to install 12.4 on the Mac during connection), but it fails to install, and asks me to do on the Mac directly. It's a bug of some sort so they might as well know about it. I can't post links yet, but the page on the Xamarin Releases pages indicates 15.9.11 includes this. Actually just open VS for Mac. It will automatically check for updates and download them. Once all of them are downloaded it display the update popup. Or go to menu Visual Studio -> Check for Updates. But as mentioned in other posts, if you upgrade VS for Mac, it will install Xamarin iOS 12.6. They should have updated the VS2017 Mac Connection Bridge to the one that is bundled with Xamarin.iOS 12.6. May be some technical issues in doing that. But if you want to use VS2017, then don't upgrade VS for Mac to 8.0 version. It may include support for Xcode 10.2 but it ships with Xamarin.iOS SDK 12.4 ... VS 2019 on Mac installs 12.6. That is where the mismatch is. It may include support for Xcode 10.2 but it ships with Xamarin.iOS SDK 12.4. I was thinking that maybe it should have been included but wasn't. That was my thinking at the time. They can't have just discontinued support for VS2017 so it SEEMS like an oversight, but who knows. @rlasker -- thanks, but your comment came just after I started the upgrade. Is there a way to put Xamarin.iOS SDK 12.6 on VS2017? Or, a way to put the VS for Mac back to SDK 12.4? I upgraded to VS2019, so far all looks fine. I suggest you to to try this, as VS2019 and VS2017 are side-by-side installations, so they won't bother each other. If your project has issues with VS2019, you can still wait for the VS2017 patch, and continue working on that. So far I haven't found a way to upgrade iOS SDK in VS 2017. FYI, I created an issue for VS 2017 over on the VS feedback web site. It has been triaged to the engineering team. Maybe it could use some votes. Sorry, I see how that was ambiguous: I kept VS2019 on Mac and allowed VS2017 on Windows to downgrade Xamarin.iOS to 12.4. @rlasker -- Thanks for trying. I eventually tried VS2019 Community, and it seems to be doing what I need it to do. FYI, MSFT has closed this issue as "not a bug". MSFT has stated that this is expected and you have to downgrade the Xamarin.iOS SDK if you want to continue to use VS 2017 (and ignore the update prompts in VS Mac 2019 going forward). Microsoft(Xamarin) can NEVER do a release without bugs. Their QA process is so poor, it is always up to the community to find hacks to their mistakes, anyhow..
Download this to your Mac and install, everything should now work with VS 2017 once again. The mono version intsallled on the MAc may not be compatible with this version of Visual Studio. Would you like us to intsll Mono '5.18' for you? This will overwrite any existing Mono installations on your Mac. The thing is that this happenned inexplicably. One day all was well, the next not. What I find really strange is that on the Mac in /Library/Frameworks/Mono.framework/Versions I have 5.18.0 dated 1st Mar and 5.16.0 dated 28th Feb. The current shortcut points to 5.16.0? This is incredibly frustrating. I experienced the same issue as others in this thread where VS 2017 updated Mono unsolicited by me, and now I am unable to move forward with my cross-platform mobile development without upgrading to VS 2019 - which is the last thing I want to do right now. For developers who use third party libraries in conjunction with our Xamarin projects (such as Monogame for example), moving to VS 2019 may not be feasible one week after the official VS2019 release. Now, I'm looking at wasting several hours either attempting to manually get my 3rd party project templates and libraries working with VS 2019 (which may not even be possible) or carefully manually reverting the recent unsolicited updates and hope for no lingering disruptive issues. Thanks a lot. At this point, I would prefer to go back to the $1,500+ per year subscriptions if I could get some decent stability to the platform upgrade process, so my development work doesn't come to a grinding halt when an unexpected forced update occurs. Back to developing in VS2017. I don't know what step(s) fixed the issue(s), but here's my experience. On Mac Build machine, downgraded VS for Mac to 2017 by 1) moving "Visual Studio" to trash, and 2) downloading and installing "Visual Studio 2017 for Mac"
FYI, VS 2019 already has an update to 16.0.. If you install this it will install Xamarin.iOS 12.8. If you go to your VS 2019 on Mac and check updates you will also see updates available for VS for Mac to 8.0.2.23, Xamarin.iOS to 12.8.0.0, and Xamarin.Mac to 5.8.0.0. I feel like there should be a sticky thread at the top of these forums to help track this. So where do you find the download link ? No luck with a quick Google. Perhaps you can dig through the GitHub releases and if not ask one of the Xamarin Devs. It is very strange that it is so hard to get specific releases. Dear, please, I need the download links to last versions of VS (for windows and for MAC) compatible with xcode 10.1. Unfortunately I had updated my VS 2019 (for windows and for MAC) and now my MAC build machine is unusefull, because it is not compatible with xcode 10.2. I think that I will need reinstall the VS 2019 16.0 (after uninstall the 16.0.1 version) on windows and the last VS for MAC compatible (what version exactly?). Is it? Somebody has the links to the exactly versions? You'll be able to download an installer for the latest version of Visual Studio 2017 via my.visualstudio.com.